Der 10. und leider letzte Beitrag von Bruce Lindsay zur technischen Geschichte von Lancia. Auch auf dem Gebiet der kommerziellen Elektrofahrzeuge im und nach dem 2. Weltkrieg war Lancia tätig und leistete einen Beitrag zum Wiederaufbau. Shortages of domestic fuel supplies in Italy during World War 2, rather than early environmental considerations, led Lancia to develop electrically-driven light commercials in 1940.It is little known that there were two versions – the E290 (four wheels, front mounted electric motor) and the E291 (six wheels, rear mounted electric motor). The E290’s proprietary Tecnomaso Italiano Brown Boveri motor produced 8.8 bhp at 1.750 rpm, while the E291’s enlarged motor produced 13.8 bhp at similar engine speed. Their range on full charge was five hours or 70kms, and their maximum loaded speeds were 28 and 30 km/h respectively. Battery packs were carried in panniers sited lengthwise between both front and rear wheels. Both motors – whose output was reversible – fed their drive through a single reduction gear, which enabled them to move as quickly in reverse as forward. The dry single disc clutch was hand-operated, allowing drivers to walk alongside their vehicles for tasks such as milk delivery, for which they were most popular. The Brescia Milk Marketing Board operated a fleet comprising both models into the 1950s. Front suspension used a transverse leaf spring and ball-joints, enabling the little trucks to turn in little more than their own length – invaluable for manoeuvring in the city streets for which they were designed. 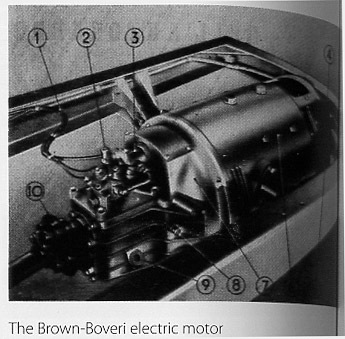 Rear suspension was by longitudinal semi-elliptic springs, four of them on the six-wheel E291. Four wheel hydraulic brakes were provided, although they were probably seldom used at the speeds of which the vehicles were capable; like jumping on the reverse pedal in the Model T Ford, the quickest way to stop them may have been to reverse the motor’s drive. 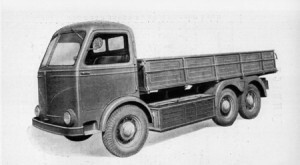 The factory offered standard metal dropside utility bodies for both versions, built by Viberti. Despite their limited power and range, the little trucks were also available as 10-seater buses and even side-tippers, working happily within the confines of Italian suburbs. Remarkably the smaller E290 could carry 4.000 kg, while the E291’s payload was 7.000 kg. Although handbooks for the electric vehicles survive, there is very little extra information freely available, and official Lancia histories ignore them altogether. This is unfortunate since the trucks appear to have been a successful first effort into electric drive by Lancia, who are known to have built 63 of the smaller E290, and 139 of the E291. These figures do however include an unknown number of vehicles which, at the end of the War, were fitted by the works with military versions of the Artena petrol engine, once domestic fuel supplies were resumed. They represent a fascinating window into Lancia’s commercial savvy as well as their willingness to tackle original technical problems, which was evidently alive and well even during hostilities. Mit diesem Beitrag schließen wir leider die Artikelserie von Bruce Lindsay aus Australien, die er im Jänner 2013 lancianews über Vermittlung von Lucas Geheniau aus den Niederlanden zur Verfügung gestellt hat. 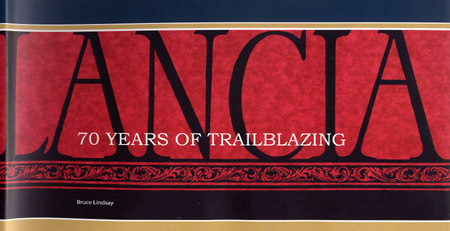 Die Beiträge und das verwendete Bildmaterial stammen großteils aus Bruce Lindsay’s Buch: LANCIA 70 Years of Trailblazing aus dem Jahr 2009, ISBN 978-0-646-51139-9, das wir Ihnen empfehlen, weil auch u.a. eine DVD mit dem Bildmaterial in hoher Auflösung beigelegt ist. Wir danken Bruce Lindsay und Lucas Geheniau für die die Bereitstellung der Artikelserie, mit der lancianews im deutschen Sprachraum einen wertvollen Beitrag zur Dokumentation der Geschichte von Lancia wiedergeben konnte.